Charlie Pickering, Ambassador for the Amy Gillett Foundation and the Hon. 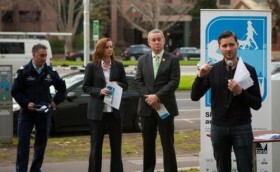 Terry Mulder, Victorian Minister for Roads today launched Sharing Roads and Paths. Sharing Roads and Paths is a guide for all Victorians that focuses on the road rules and safe behaviours when sharing spaces with bicycle riders. Amy Gillett Foundation Chief Executive Officer Tracey Gaudry said the guide was an important step in creating a safer environment for bicycle riders. “Sharing Roads and Paths is a fantastic initiative for all Victorians. The guide is for everyone. We all use roads and paths whether as a driver or passenger, a bicycle rider or a pedestrian. Often we get about in many of these ways throughout the day,” said Ms Gaudry. Sharing Roads and Paths is the achievement of a major collaboration facilitated by the Amy Gillett Foundation with Victoria’s major transport, motoring, cycling and pedestrian groups. The project was funded by the Victorian Statewide Community Road Safety Partnership. “Not only is it a handy reference tool but it is a reminder to us all as road users, whether it be as cyclists, drivers, motor bike riders, or pedestrians, that we all have a role to play in respecting each other on the road and making the roads safer,” Mr Mulder. Supported by RACV, Sharing Roads and Paths is an important tool for drivers to better understand their responsibilities when sharing the road with bicycle riders. Sharing Roads and Paths is a guide for all Victorian road users on all Victorian roads and shared paths. It will help everyone understand what each of us can do to make our roads and paths safer for everyone. Sharing Roads and Paths is a collaborative project involving the Amy Gillett Foundation, VicRoads, Victoria Police, City of Melbourne, RACV, Cycling Victoria, Bike Safe, Monash University, Victoria Walks, Bicycle Network Victoria, Cycling Promotion Fund, Retail Cycle Traders Australia, Baw Baw Shire Council and Mornington Peninsula Shire and was funded by the Victorian Statewide Community Road Safety Partnership.